Dr. Linh Luu at Bunker Hill Pediatric Dentistry of Houston provides best practices and information for moms and dads to keep up with their children's dental health. One of the questions your Houston Pediatric Dentists always ask is if your child has been brushing and flossing regularly. Now, many children brush their teeth once or twice a day. It is easy to do and take only a couple of minutes. Flossing is another story. It is not a top priority for many and some just never do it. However, flossing is necessary for your child's healthy gums and teeth. Let's learn seven things about flossing that might help make it a priority. #1 Flossing helps keep your breath fresh. Food debris can get caught between your teeth and gums. Using floss to clean between your teeth helps to remove this debris as well as any plaque build-up. If you don't get that debris and plaque out of there, your breath will start smelling. Don't drive people away with bad breath. #2 Twenty inches of floss will do it. Floss usually comes in a roll that you pull out and break off. Dentists recommend using between 18 and 20 inches for a single cleaning session. This allows you to grasp the floss securely while still having plenty of clean floss available. And, of course, if you find you run out, get some fresh floss to finish the job. #3 Bleeding gums are no reason to stop flossing. If you don't floss regularly, your child's gums may start bleeding the next time you do it. Don't let that be an excuse to stop flossing. 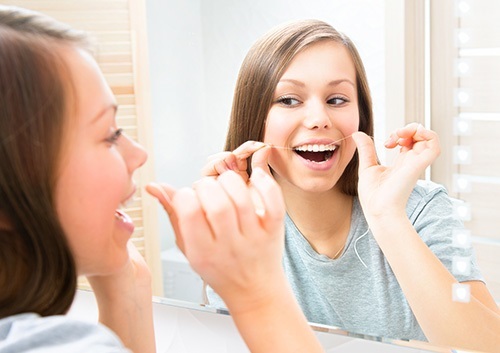 Consistent flossing helps to toughen the gums and the bleeding will gradually stop. #4 Flavored flosses make flossing fun. Walk down the dental aisle and you will find flosses in a number of flavors. The most common ones found at your typical pharmacy will be bubblegum, mint, and cinnamon. However, if you want to get adventurous, you can find floss in a number of other flavors like bacon, grape, dill pickle, and cupcake. Yum? #5 Flossing covers the 30% that brushing doesn't get. Your toothbrush only reaches 70% of your tooth surface. So, no matter how hard or diligently you brush, you are not going to reach that remaining 30%. That is where flossing takes over. The floss can reach down between the teeth and scrape the remain surface debris and plaque away. #6 Wearing braces and flossing go hand in hand. Wearing orthodontic equipment like braces poses a special challenge for keeping the teeth clean. Brushing can only remove so much food debris from around the braces. Traditional flossing can only go so far due to orthodontic equipment. Floss threaders and proxabrushes are two options that make it easier to get all the food debris out. Floss comes in many types. Monofilament floss is usually made of rubber and plastic. Multifilament floss uses silk and nylon instead. Waxed floss is perfect for getting in between tight teeth. Non-waxed works well everywhere else. Next time you see your Houston Pediatric dentist or hygienist you should be able to say that you brushed and flossed regularly. If it's time for your next visit, call us today to set an appointment.